Broccoli is definitely a staple in my garden every year. Not only does fresh homegrown broccoli taste amazing, but it’s super healthy! 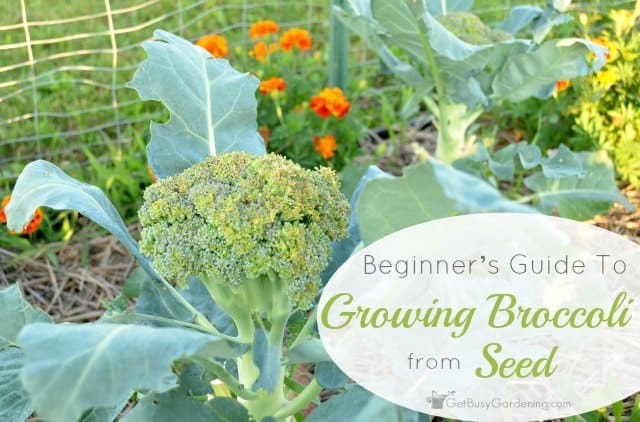 Growing broccoli from seed can be a bit challenging for beginners, but it’s not difficult. 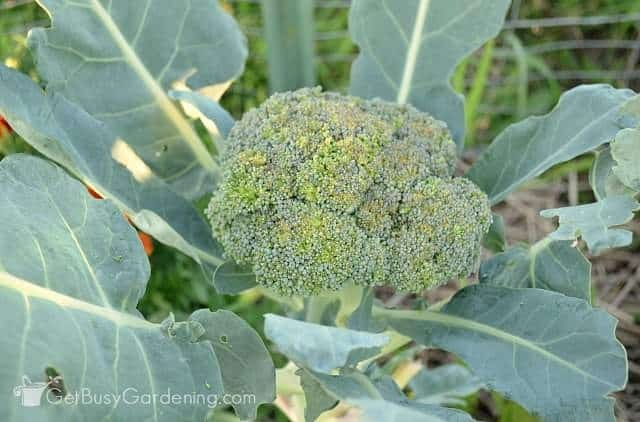 In this post, I will tell you all about growing broccoli in your garden, and give you all the information you need for planting broccoli seeds. Broccoli is a brassica and is part of the cabbage family of plants. There are a few different varieties of broccoli plants that you could grow, some take longer to grow than others. Di Cicco, Calabrese, Green Golliath and Waltham are a few of my favorite varieties. If you have kids, there are a few super fun varieties you should try too. Kids love weird stuff, so try growing purple broccoli seeds for them, or get them to help you plant some broccoli romanesco seeds. Growing broccoli from seed (especially weird varieties) might just get them to finally eat their vegetables! One of the things I love the most about growing broccoli in my garden is that it’s cold hardy. Here in Minnesota, our growing season is very short. So, any time I can grow something that is frost hardy means it’s going to be much less maintenance for me! Growing broccoli from seed is pretty easy, which is another reason it’s one of my favorite crops to grow. 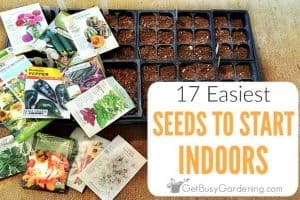 If you live in a cold climate with a short growing season like I do, then it’s best to start seeds indoors in seedling trays or using a seed starting kit. Broccoli grows best in a location that gets full sun, in soil that is rich in organic nutrients. They are heavy feeders, and like their soil kept evenly moist but fast draining. To create the perfect soil for growing broccoli plants, amend your soil with rich compost, well rotted manure and/or worm castings. I also like to mix an organic granular fertilizer into my soil before planting broccoli seedlings. Since broccoli is a cool weather crop, it’s a good idea to mulch the soil around the base of the plants to help keep the roots cool (the mulch will break down over time and help to feed the soil and plants too). There are different types of broccoli plants, and each variety can have slightly different seed growing requirements and seed starting dates. So be sure to read the seed packets to figure out when to plant broccoli seeds. 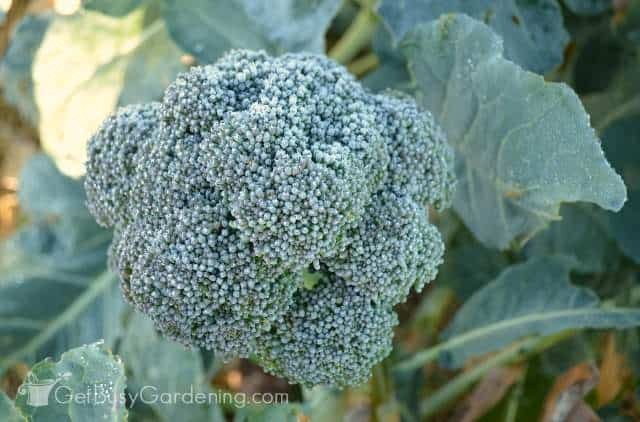 But in general, broccoli seeds should be started indoors 4-6 weeks before your average last frost date. 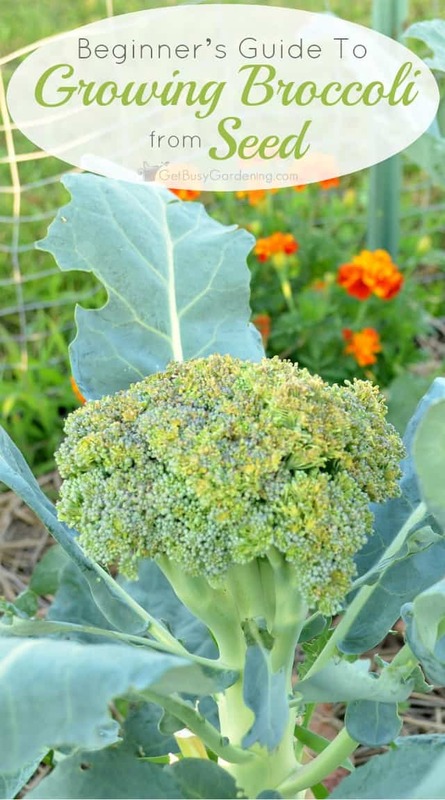 If you live in a warmer climate that has a longer growing season, then you can plant broccoli seeds directly into your garden as soon as the soil is workable in early spring. The general rule of thumb for planting seeds is to plant them twice as deep as the seed is wide. Broccoli seeds are pretty tiny, so plant them only about 1/8″ – 1/4″ deep. Once you’re done planting your seeds, you might wonder “now what?!”. Well if you ask me, this is where the fun of growing broccoli from seed really begins! I love the anticipation of seeing tiny baby seedlings emerging from the soil. Don’t worry, you won’t have to wait too long. 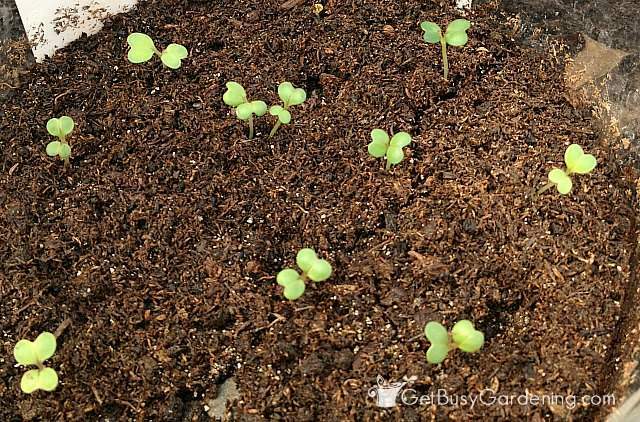 Broccoli seed germination time – Germinating broccoli seeds takes about 5-10 days depending on how warm the soil is. Warm soil will speed up broccoli germination, while cold soil will slow it down. If you want your seeds to germinate faster, put your seedling trays on a seed starting heat mat to keep the soil nice and warm. Watering broccoli seedlings – From the time you plant broccoli seeds, you always want to make sure to keep the soil evenly moist. Broccoli seedlings won’t grow well if the soil is too dry or too wet, and improper watering of seedlings can lead to problems down the road. So make sure to check the soil daily. A soil moisture gauge can come in handy here too. Broccoli seedling lighting – Broccoli seedlings need a lot of light or they will stretch and grow leggy. Add a seedling grow light as soon as your seedlings start to emerge. The light should hang a few inches above your seedlings at all times (move the light up as the seedlings grow), and be kept on for 14-16 hours per day. I made my own seed starting grow lights using an inexpensive fluorescent light fixture with plant grow light bulbs for my seedlings. Whatever you decide to use for lighting, I definitely recommend getting yourself an inexpensive outlet timer to control the lights for you, it’s so much easier than relying on your memory. 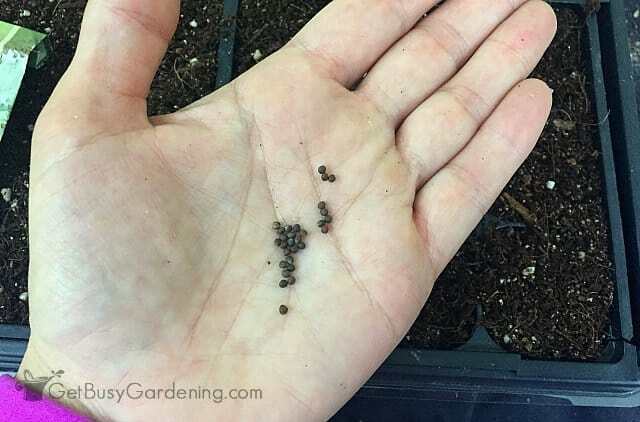 Fertilizing broccoli seedlings – As I mentioned above, broccoli plants are heavy feeders. So give them a good start in life by feeding your broccoli seedlings as soon as they start to grow their first true leaves. Start with a weak dose of liquid fertilizer, and gradually bump it up to full strength as the seedlings mature. I recommend using an organic compost fertilizer, which you can get in liquid form, or buy compost tea bags and brew your own. 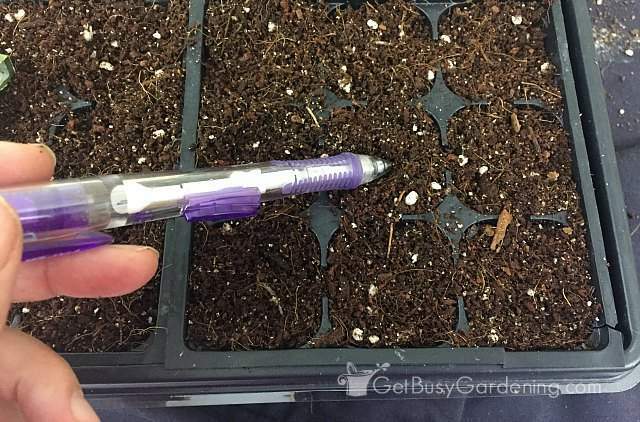 Other types of organic plant fertilizer that work great on seedlings are fish emulsion or liquid kelp (but those can get a little stinky when you use them indoors). Learn more about caring for seedlings here. 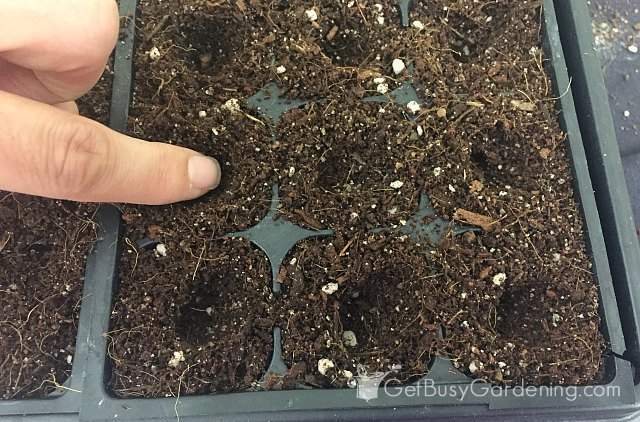 Transplanting broccoli seedlings – When growing broccoli from seed indoors, wait until your broccoli seedlings have their first few sets of true leaves before transplanting them into the garden. Broccoli seedlings are frost hardy, so they can be planted into the garden 2-4 weeks before your average last frost date in the spring. 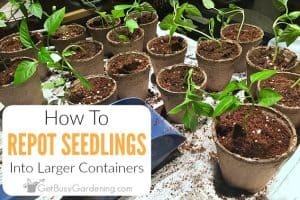 Seedlings growing indoors must be hardened off first, so make sure you do not skip this critical step or your seedlings could die as soon as you plant them. 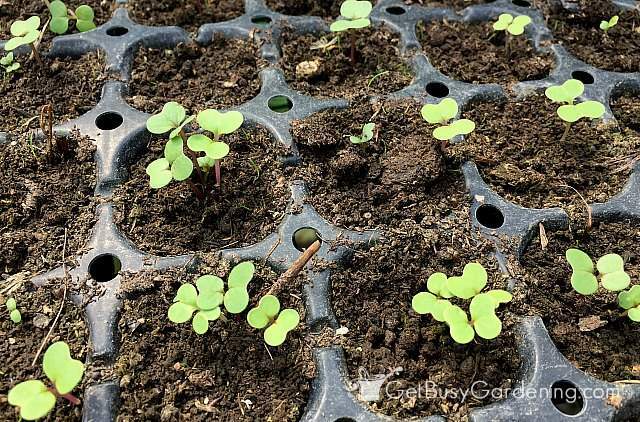 Learn about the timing for when to transplant seedlings into the garden here. 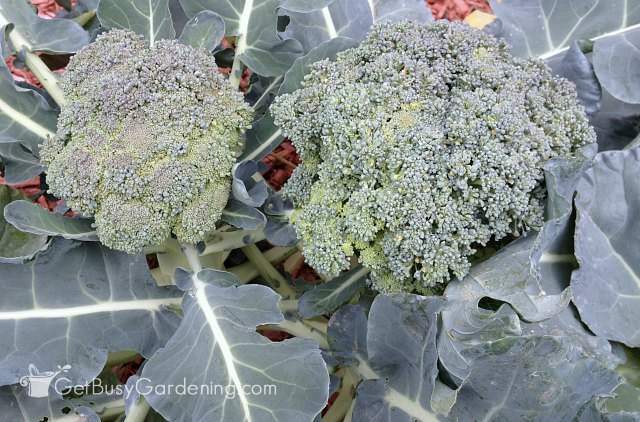 Broccoli plant spacing – Broccoli plants need room to grow, so don’t overcrowd them. 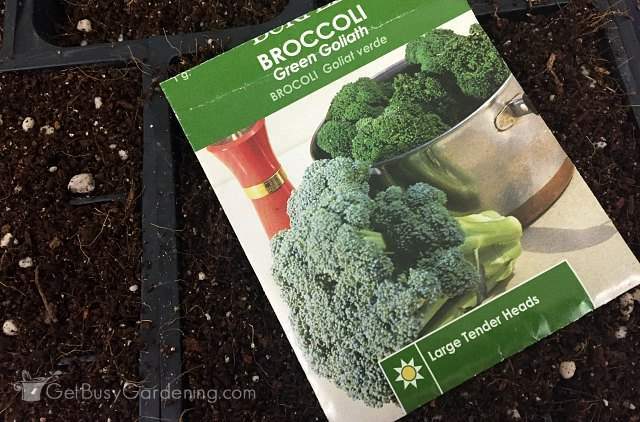 Space your broccoli seedlings (or direct sow the seeds) 12-24 inches apart (read the seed packets for exact spacing recommendations for the variety you’re growing). It will look funny when the seedlings are still small, and you might think you left too much room. But trust me, once the plants grow to full size, they will fill in the space nicely. The first time you grow broccoli in your garden, it can be tricky to figure out when is the exact right time to harvest. If you don’t harvest soon enough, eventually your broccoli will bolt (i.e. : grow flowers). You definitely want to harvest before that happens. So harvest broccoli when the buds are still tight and green. If the buds are big and starting to turn yellow, then harvest it right away (cause it’s about to bolt). Each broccoli plant will only produce one main head. But after the main harvest, a bunch of smaller side shoots (tiny broccoli heads) will grow, which you can usually harvest all summer long. So don’t cut your plant down to the ground or pull it after you harvest the first large head. Also, broccoli tastes better after frost, and it makes broccoli taste sweeter. So if you have time, allow your broccoli plants to be touched by frost before harvesting broccoli heads. Growing broccoli from seed is so rewarding, and super fun too! Once you get the hang of it, it’s super easy. 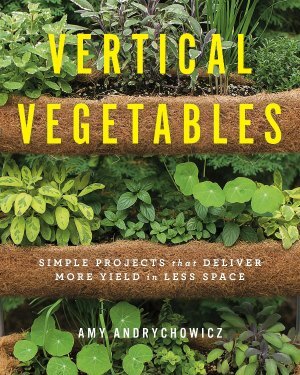 Plus, you can grow some pretty cool varieties when you buy seeds rather than seedlings. 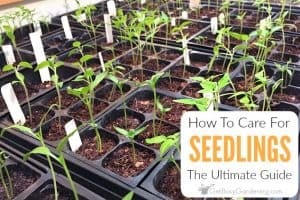 If you need more help in the seed starting department, and want to learn how to grow all of your garden plants from seed, check out my online seed starting course. 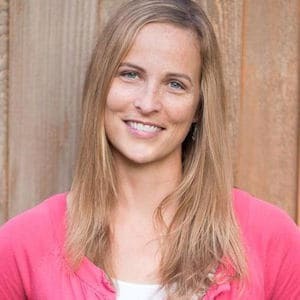 This comprehensive, self-paced, step-by-step online course is specifically designed to teach beginners how to grow seeds. Share you best tips for growing broccoli from seed in the comments section below. Is brocoli suitable with peat soil? Broccoli grows well is a slightly acidic soil, which is what a peat soil would be. 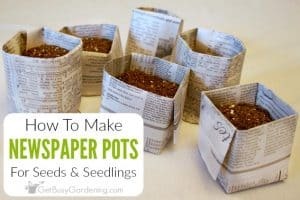 But, they are heavy feeders and need fertile soil as well, so I would recommend amending your soil with compost or other organic soil amendments. Never grew any vegetables before broccoli is just one I’m growing indoors. Started seeds on may 12th, it is now may 20th, the stems are about 2 inches in height and drooping over is this normal, what should I do? When you say the seedlings are drooping over…do you mean they are falling over at the base of the stem and dying? If so, that is called damping off and there’s nothing you can do for the seedlings that already have it. Next time, be sure to disinfect your seed trays before you use them again. Otherwise, if your broccoli seedlings are growing leggy and flopping over, that means they aren’t getting enough light, and you need to add grow lights.